Tonight an epic concert is happening at Madison Square Garden in New York to benefit the Robin Hood Relief Fund, and you can watch or stream live starting at 7:30pm EST. Rumor has it that Nirvana will reunite and Paul McCartney will join them for a song. I got this website from my buddy who informed me about this site and at the moment this time I am browsing this site and reading very informative content at this time. 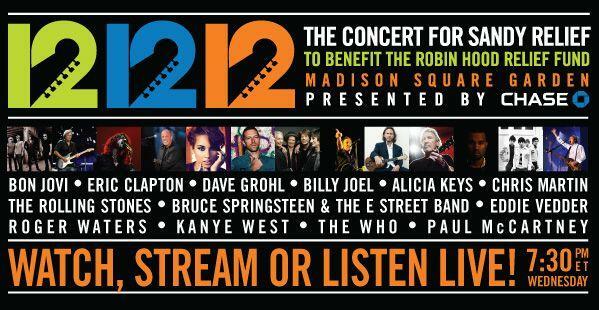 Concert For Sandy Relief. And I do have some questions for you if you don’t mind. Could it be just me or does it look like some of these remarks look like they are coming from brain dead visitors? And, if you are writing on additional online social sites, I’d like to follow everything new you have to post. It will be the best time to produce a couple of ideas with the longer term and it’s really a chance to feel special. We have check this out release of course, if I could I wish to counsel you some attention-grabbing troubles or perhaps information. You’ll might generate upcoming reports in regards to this post. I’m going to get more info things close to it! Many thanks for almost every other helpful blog. Wherever else may I am which style of data developed in such a perfect approach? I’ve a concern that we are purely at this point managing about, so i are already with the start looking out there intended for this kind of info. Very nice post. I just stumbled upon youhr weblog and wished to say that I’ve really enjoyed browsing your blog posts.